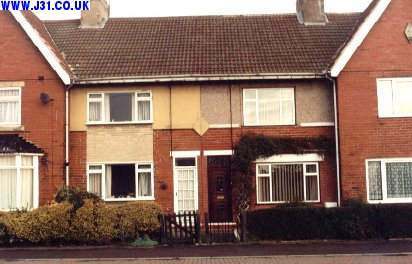 This is one of the terraced houses in Laughton Common. It has a date stone indicating that it was built in 1906, about the time that Dinnington and Thurcroft collieries were being sunk. Many such terraced houses still stand and give good service, but see the White City page for temporary post WW2 housing that has now gone. 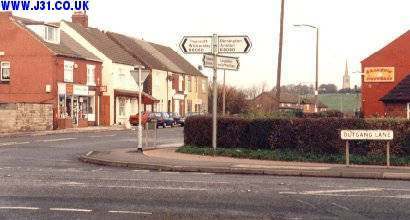 Below is Laughton Commons crossroads again (the Gallows pub is just off the picture). On the hill can be seen the 185ft spire of Laughton en le Morthens church.